IGN has the exclusive reveal of a game called Hard Corps: Uprising, which is the sequel to the 1994 classic Sega Genesis game, Contra: Hard Corps. Despite the lack of "Contra" in the new game's title, which will hit Xbox Live and PSN later this year, Hard Corps: Uprising is very much a Contra game at heart complete with plenty of weapons, side scrolling action, aliens, and one hit kills. New to the game is a mode called "Rising" in which players can actually take three bullets before dieing. Arc System Works, who created the beautiful BlazBlue and Guilty Gear fighting games, is developing Hard Corps -which explains the new hand drawn anime art style. On the co-op side of things the game will support two player co-op either locally or online as one player controls Colonel Bahamut, who was the main villain in the original game, and the other player controls his yet to be officially named "pal." Other characters will most likely be added as DLC. 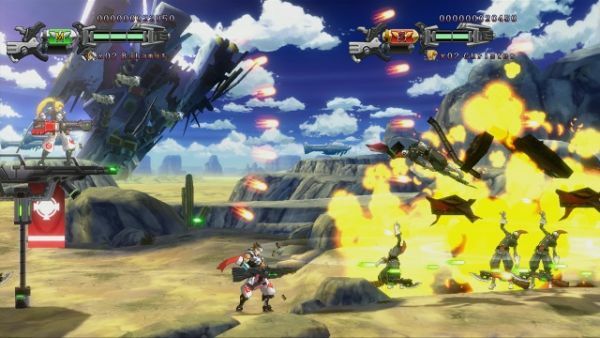 The game is targeting a Winter 2010 release. Page created in 1.1072 seconds.